Foldable and Lightweight Design- This table is designed with foldable top and legs. When you are not in need, you can put it in the corner and it doesn¡¯t take up much space. With the light weight, it is also very easy for you to remove. Easy to Clean- The top of the table is made of aluminum, which is waterproof, scratchproof and not easy to get rusty. Because of this feature, it makes much easier for you to clean after use. No assemble needed- This table is not needed for assemble. It can be easily set up and folded within several minutes. 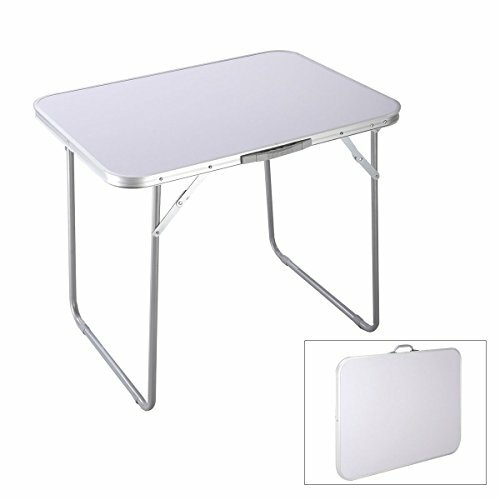 Multifunctional Use- This portable table is a good choice for family reunions, picnics, camping trips, buffets or barbecues. It is perfect for both indoors and outdoors use.